Very often, CRM entities are used as reference data tables, for example to keep a list of countries, states or provinces or other business/industry specific data. For some businesses I have seen entities to keep a list of distributors, list of business roles, regions to only name a few. When used that way, CRM entities provide a lot of great features that cannot easily be met with option sets such as the ability to manage large reference tables, lookup search, lookup filtering, ease of adding/editing/modifying data by power users without a deployment. One of the issues with using CRM entities for reference data is that they is no concept of multi-language lookup in the Dynamics 365 / CRM platform. Lookups will always display the value of the primary field by default. This can cause an issue in places where you must have a fully multilingual application. In this article, I provide a few possible solutions to solve this issue. You will be disappointed, this is not a fancy solution. In the Task Activity entity, we have one field for the name in both languages and use concatenate both field values in the primary field using a workflow or plugin. This is the most common approach that I have seen when the number of languages is small (2 languages). This has a disadvantage of sometimes creating long name values that are not fully visible in the views and on the forms, but it’s cheap and you keep the ability to search using lookup, and display the columns in French or English the views if you need to. This solution is a little more interesting, but risky. In the Task Activity, we still have one field for the name in both languages and we still concatenate both field values in the primary field. The principle is to write plugins on the Retrieve and Retrieve Multiple events of the Task Activity. In both of these plugins, you need to retrieve the connected user’s language (query the user settings table), and then replace the text being returned in the Name field by the value in the user’s language. This value can be obtained by querying the task activity record and retrieving the name in French or English, or simply splitting the Name field (primary field) with the separator and return the part in the desired user’s language. One plugin will handle the lookup column in list views (Retrieve Multiple), and the other will handle the form views (Retrieve). Generally, it is not recommended to write plugins on the Retrieve and Retrieve Multiple events for performance reason. If the operations executed in those plugins are simple and optimized, it might be a viable solution. This is a solution that can scale well if you are dealing with more than 2 languages because in all cases, users see only the value in their selected language and the multiple values are transparent to them. Stay tuned, I have an upcoming post where I provide some metrics about the impact of a plugin on Retrieve and Retrieve Multiple on performance. You can then get the CRM Translation file and get the Task Activities values translated as part of the global solution. While this has low impact on performance and leverages the out of the box language-aware option sets, it requires a serious time investment to define the development framework for each entity that required this mechanism to be implemented. It also requires a translator to update the CRM translation on a regular basis (every time there is a deployment). This is a fancy solution that requires a lot of coding and maintenance. In addition to that, you lose the ability to search and filter the content easily like you would do with lookups. You should make sure yours lists are not very long if you don’t want to end up with Option Set lists that are very long which will result in poor user experience. I have rarely seen companies making such large investments to circumvent the lack of multi-language lookup in CRM. This is usually seen when there are laws that force you to have a system running fully in multiple languages. Writing a standard web resource control for that purpose is relatively simple. However, you might have additional work to do if you want to take advantage of filtering based on other fields, or custom filters. Also, this solves the issue on the form in the sense that you will see the values in the right language on the form, but for list views, reports etc. the problem will still exist so you’ll need to find another solution there. As you can see there is no perfect solution. Each organization has to decide the level of investment and risk they want to take to make sure they have multi-language option sets. Living in Canada where we have two official languages, this is a challenge that we often see in public sector implementations because having fully bilingual system is mandated by law. There are very few countries where this is the case (which is probably why Microsoft has not made investments in this area). Most private sector companies will usually impose a primary language for the entire organization. As a CRM Solution Architect, one thing that I often try to do is keep the complete solution package with a minimal amount of components in order to simplify the deployment process. In an ideal world, we want to limit a deployment to a solution deployment. In reality, this never happens on complex implementations. The purpose of this article is to point out some of common elements that are typically deployed as part of a CRM solution deployment. 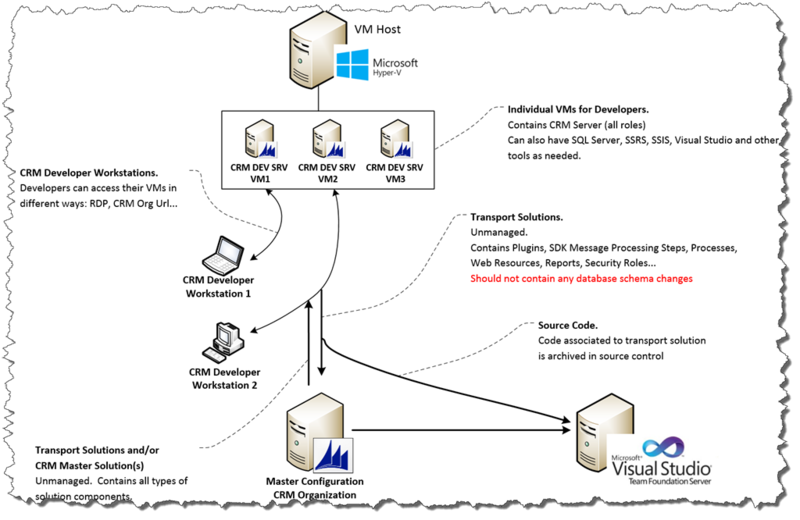 CSV Files for data import: There is often a need to load master data on the system. For example, if you have entities for “Country” and “State”, you may want to populate them with data before people start using the system. This is easily done with a CRM data import wizard. Run Workflow(s) against a specific set of record: This is a technique that is often used to fix data issues. Examples of use: change record ownership, populate new fields created as part of the current release, delete records (data clean-up). Perform data load from external source: Loading data is usually done by external system (SSIS, Scribe, custom integration etc.) that have connectors to CRM. As part of a CRM deployment, you’ll often have to run data load/update tasks after configuring your integration service to point to your production server. This is used to do data migration or to enable on-going integration between multiple information systems. Deploy custom web services and/or web sites: To provide extended integration with CRM, we often need to create our own web services that expose custom operations involving CRM data. We also frequently see the need to build custom web applications outside of CRM to display complex and/or integrated data within CRM screens or to create external portals. These web services and web apps become part of the release cycle of your CRM solution. When delivering enterprise solution deployment packages, one best practice is to always plan to automate the deployment of all components that be can be automated. It shortens the solution package deployment process, limits the possibilities of human errors and helps make deployment administrators happier which results in them having a better relationship with the solution and product (I speak from experience J).